WE HAVE DONE THE HARD WORK, NOW YOU SIMPLY NEED TO HEAT AND SAVOUR GREAT FRENCH SOUP! Goes great with bread for a wholesome soup meal, or with a sumptuous main for a nice French dinner. Watch our videos for behind-the-scenes exclusives! Let's try a few packs now! WHAT ARE SAYBONS' TAKE-HOME SOUP PACKS? 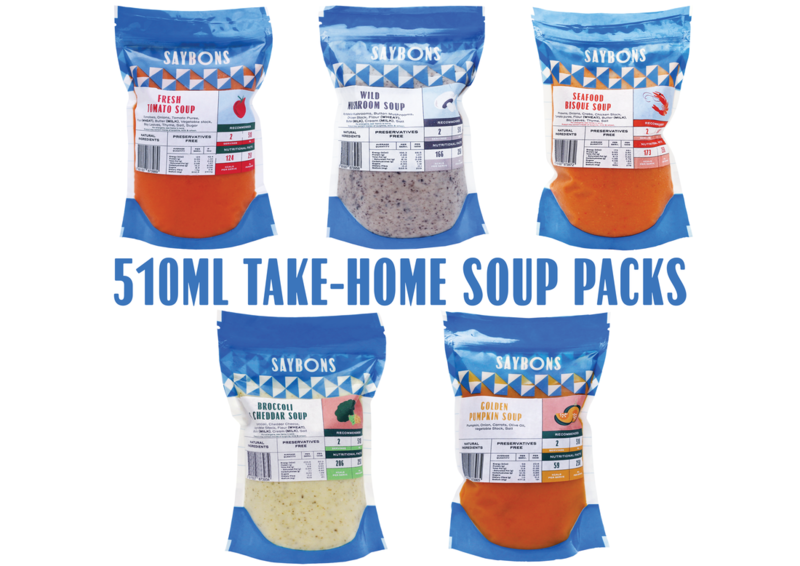 They are 510ml packs of our media acclaimed soups, meant for your take home enjoyment. The soups need no further cooking or additonal water; simply pour, boil and drink! HOW MANY SERVINGS ARE THERE IN EACH PACK? Each pack contains 2 regular servings. Certainly, someone who loves soups can finish the whole good pack at one go too! DO THEY CONTAIN ANY PRESERVATIVES? Our soups do not contain any preservatives. They are made from scratch daily with the freshest ingredients in our central kitchen. HOW LONG DO THE SOUPS LAST? Our frozen soup packs are tagged with a one month best before date from the time of manufacture, and with a 10 days best before date if they are packed chilled. WHY DO YOU HAVE BOTH FROZEN AND CHILLED PACKS? Chilled soup packs are made available specially for customers at our stores. They do not have to be defrosted, so you can quickly just pour, boil and drink. Convenience at its best! HOW DO I USE THESE SOUP PACKS? Pour, boil and drink! We do not suggest directly microwaving nor boiling of the plastic packs. Pour out the contents into a pot over the stove and heat until bubbling, or pour the contents into a microwavable container and reheat your soup at medium/high heat, depending on your machine’s settings, for 2-3minutes. ARE THEY SUITABLE FOR SPECIAL DIETS? Yes indeed! All our soups are vegetarian except for our mushroom soup and seafood bisque; the soup base used to boil is chicken stock. Only our pumpkin and carrot soups are gluten-free, as the rest contain flour. All our soups except the broccoli cheddar and mushroom soups are cream-free. Definitely! However, we do not recommend our seafood bisque for younger toddlers as they maybe allergic to seafood. Avoid our soups as well if you know your child is lactose (milk/cream) intolerant. Otherwise, our blend of vegetables will be a great way to get your child to have his/her portion of greens for the day! WHERE CAN I GET THE SOUP? Our soup packs are available at Saybons stores, or online at www.saybons.com. We currently also have a partnership with Qoo10 and are sold on their online platform. Our team also does roadshows and soup parties at schools, hospitals and offices. Feel free to drop us a note at catering@saybons.com if you would like us to bring our soup packs to your organisation or event. They have proven to be very popular! DO YOU DO HOME DELIVERIES? ARE THERE ANY DELIVERY FEES? Yes, you can have them delivered at a fee of $15 per trip for up to 5 packs ($30/trip for 6-10 packs etc). To ensure optimal delivery conditions, we use third party cold trucks for most of these deliveries, hence delivery charges may not be the lowest in the market. We will look at better delivery options as we get more requests for home deliveries.